This special issue includes 5 papers from South African and UK-based authors, as well as an invited paper from Dr Mary Lea and 3 book reviews. 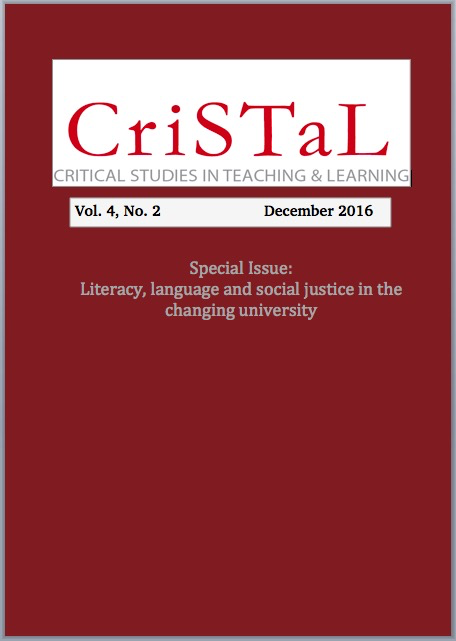 The papers address aspects of academic literacy and social justice in higher education, including physics and mathematics education, the role of religious faith as a tool for meaning making, challenging conceptions of decontextualised literacy, and bringing students' multiple language resources into teaching and writing to create more equitable and inclusive learning environments. Book review: Working with academic literacies: case studies towards transformative practice. Lillis, T., Harrington, K., Lea, M.R. & Mitchell, S. eds. Book review: Detox your writing: Strategies for doctoral researchers. Thomson, P. and Kamler, B. Book review: Posthumanism and the Massive Open Online Course. Knox. J.